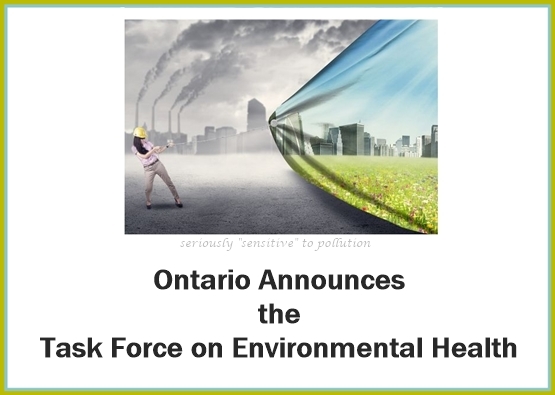 The Government of the Province of Ontario, specifically the Ministry of Health and Long-Term Care (MOHLTC) finally announced the establishment of a Task Force on Environmental Health. Let’s hope this new project creates the long overdue and effective changes and access to basic services that are needed by people with environmentally linked, disabling, chronic health conditions like MCS/ES, unlike the 1985 project which created a 600+ page report with recommendations that were largely ignored (see links below), which allowed these and other problems to fester and increase in severity and magnitude. Secretariat support for the Task Force is provided by the MOHLTC. Regular updates will be provided to interested stakeholders. If the 1985 report recommendations been taken seriously, it is likely that many childhood allergies, learning difficulties, cancers, reproductive problems, and numerous other types of chronic and costly health problems currently linked to pollutants could have been prevented, along with the suffering of hundreds of thousands of people who are disabled from everyday exposures to toxic and unnecessary chemicals currently used in everyday products and materials. Let’s hope this task force does the right thing for present and future generations. This entry was posted in Environmental Health, Environmental Sensitivities, Government, Health, Health Care, Human Rights, Policy and tagged chemical sensitivity, fibromyalgia, health care access for people with MCS/ES, health effects, MCS, MCS/ES, multiple chemical sensitivities, Myalgic Encephalomyelitis/Chronic Fatigue Syndrome, Ontario, petrochemicals, toxic. Bookmark the permalink. This is great long over due news, way to go again Ontario. Hoping it’s contagious and spreads West as it is here we have nothing at all, scary place for one suffering such conditions,however due to ”cold allergy” and ”cold triggered asthma ” I am stuck here without any supports on environmental treatments.No supports or recognition of environmental Illness .No ME or CFS groups either. If some would complain perhaps at least a support group at least.. Thanks for this great update. Be Well. It’s an excellent post with several good resources linked. “One of the more outrageous claims that the chemical industry and its associates make is that the World Health Organization (WHO) supports the name change from MCS to IEI. The WHO was one of the sponsors of an International Programme on Chemical Safety (IPSC) workshop on MCS held in Germany in February 1996. This workshop was dominated by industry-associated participants and had no representatives from environmental, labor, or consumer groups. Instead, the non-governmental participants were individuals employed by BASF, Bayer, Monsanto, and Coca Cola (43). It was at this meeting that the decision was made to try to change the name of MCS to IEI…. In any case, the WHO issued a statement to the workshop participants after the meeting to try to put a stop to claims that WHO supported the name change from MCS to IEI. It goes on to say that “with respect to ‘MCS,’ WHO has neither adopted nor endorsed a policy or scientific opinion” (45). Ronald Gots, director of the Environmental Sensitivities Research Institute, whose members included DowElanco, Monsanto, Procter and Gamble, and the Cosmetic Toiletries and Fragrances Association, was a participant and ‘was also invited to give the “U.S. perspective” on MCS’. Various outside “observers”, some of whom were involved in a lawsuit about “wood preservative syndrome”, were involved in drafting and possibly voting on the recommendations. For those who like history and want to see evidence of the genocide that is occurring, here’s the 1985 report, and the site is full of other historical tidbits. “They” know we’re here, they know what we need, yet they have been making sure we don’t get it. Why would we are should we expect anything different? Am I to understand this task force will present their findings at the end of 3 years with no help during their time of study? 3 years is a very long time when your health is failing. I’m not aware of any short term benefits. I’m hoping they find a way to deal with the growing number of industry barriers so they can properly address reality and the public health crisis that is upon us. Not to be argumentative but if they could not manage those problems in 1985 what has changed? More people sick some with more severe illnesses more science I guess. I hope there is a reason to be hopeful. I guess we are at their mercy as always. I read part of 12,000 Canaries Can’t be Wrong by John Molot. Chapter 23 on the politics of medicine certainly left me feeling skeptical. One short term benefit would be to educate doctors wide scale so when a person tells the doc smells are making me really sick some help could be found before it gets worse. As far as I have seen so far ( I am newly dx) their is not much help but learning how to avoid and how to detox some at least could be helpful. I had trouble with smells 10 years ago and mentioned it docs who had no response. Now I have a movement disorder and am newly dx… after a 2 year wait on the list. I would think had I know a few simple things sooner maybe I could have slowed the progression of this disorder…maybe. I’m not any good at playing politics and have no idea how they will overcome the industry barriers and address these issues in a way that truly helps people. Dr Molot has a blog and he wrote about progress and setbacks earlier in the year. Members of the task force as per Ministry website on January 23, 2018. Note the addition of Dr Christine Oliver.